Government contracting fraud is a crime of opportunity. It involves wrongs perpetrated by people who are in a position of trust. It is a crime that amounts to stealing from the government at best; at worst, it can put our military at risk or pose a threat to public health/welfare. Once an individual has been convicted of government contracting fraud, should they be afforded the opportunity to hold a leadership role in a company that contracts with the government again? Can we trust them? In this post our government contract fraud attorney looks at one state’s proposal that addresses that very issue and also at how government contract exclusions operate in the health care arena. 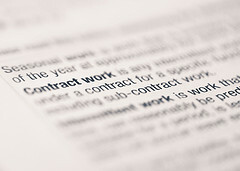 Last month, news site NJ.com reported on a bill moving through the New Jersey legislature that would create a one-strike rule for government contractors. If passed, the bill would create a permanent bar preventing a person convicted of second-degree government fraud from ever again serving as a “key employee” in a company that holds government contracts. The bill would only apply to higher-level employees, a group that ranges from C-level executives, presidents, and vice-presidents to directors and supervisory managers. The focus is on decision-makers and it does not impact the day-to-day employees who may be “caught up” in a fraudulent contracting scheme. Under the proposed legislation, New Jersey’s state treasurer would be tasked with maintaining an online list of those individuals who are subject to the permanent ban. Companies in the state would have to provide a written certification stating they do not employ any of the named individuals before being allowed to receive a government contract. One of the bill’s sponsors, Assemblyperson Daniel Benson points out that lawyers and doctors can lose their professional licenses if they commit certain wrongs. He states, “This is a situation where somebody defrauded the government of taxpayer dollars. They shouldn’t be allowed to have another chance.” Co-sponsor Assemblyperson Reed Gusciora suggests the bill sends a clear message that those who work for the government and serve the taxpayers must carry out their jobs in a fair and honest manner. An exclusions process like that proposed in New Jersey is already used in the Medicare arena, although health care exclusions are typically temporary. The federal Office of the Inspector General (“OIG”) has the authority to bar both individuals and entities from participating in federally funded health care programs. Exclusions can be the result of a range of wrongs and there are both mandatory and discretionary exclusions. The list of mandatory exclusions, situations in which the OIG must exclude a party from participating in Medicare or other government health care programs, includes individuals who have been convicted of Medicare fraud. Exclusion is permitted but not mandated in the case of a fraud conviction involving a health care program that is not government run. The main effect of exclusion is that the individual/entity and any company that employs such an individual as a key employee cannot receive payments from Medicare or other government health care program for services or goods (ex. Medicare will not pay a hospital employing an excluded individual as a key employee for services provided to a program beneficiary). Exclusion focuses on contracting and claims for payment; it does not impact an individual’s rights as a Medicare or other program beneficiary. The OIG maintains a List of Excluded Individuals/Entities (LEIE). Employing an excluded individual is considered a form of fraud. In fact, per a review of an OIG list of cases in which companies paid money pursuant to a settlement or judgment in a health care fraud matter, employing an excluded provider or other individual is one of the most common forms of health care fraud (list is regularly updated, frequency of excluded individual cases noted as of March 2015). The summary of a case involving an Arizona group home explains: “Under federal law, a provider who has been excluded from federal health care programs can neither provide services to Medicare or Medicaid beneficiaries nor have those services paid for by Medicare or Medicaid.” In that case, the company paid nearly $42,000 to settle certain excluded individual claims. Other excluded individual settlements include an $111,969.11 payment by an Alabama hospital (summary dated 1/30/15), a $96,259.57 payment from a Minnesota pharmacy (summary dated 1/23/15), and a California lab that paid over $1.9 million to settle allegations involving four excluded individuals (summary dated 8/5/14). Government contract fraud is a financial crime that can have wide-ranging repercussions. It can impact public health, endanger the safety of our armed forces, and have drastic effects on the well-being of our nation and our citizens. Individuals and entities that commit government contract fraud abuse the trust of the American government and the American people. If you have witnessed government contract fraud, it is your duty to report it. Our government contract fraud lawyers understand that this is easier said than done. We are committed to using our knowledge and experience to protect whistleblowers and, where their involvement leads to a recovery, ensure they are compensated appropriately. We act as a partner and a guide, working with these brave and honest individuals to fight fraud, recover wrongfully diverted government funds, and protect our country and our fellow Americans.